Featured picture: The Chinese frigate Hengshui and destroyer Xian lead a multinational task group during RIMPAC 2016. Photo: US Navy. 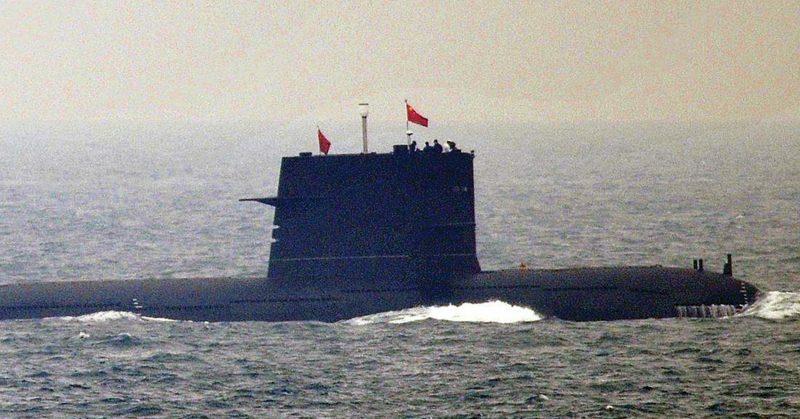 As China reaches for true globe-girdling great power status, the new generation ballistic missile submarines of the People’s Liberation Army Navy (PLAN) are a key element. Just as the Soviet Union strove in the 1970s and 1980s to make the Arctic a bastion for its own SSBNs, so the PLAN today wishes to cordon off the deep waters of the South China Sea in which to hide its ‘Bombers’. The coral islands and reefs China has seized control of and swiftly turned into naval fortresses – host to airstrips and berths for warships – are to project Beijing’s ownership over a vast area of ocean. China will soon create a Sound Surveillance System (SOSUS) cordon, constructing listening posts on the fortress islands to ensure that no intruding US Navy or allied submarines can operate in the South China Sea undetected. It will then send its Shang Class attack boats (SSNs), advanced diesel-electric submarines and increasingly powerful and numerous Anti-Submarine Warfare (ASW) patrol vessels, plus surveillance aircraft, to counter trespassers. It means the new Jin Class vessels, which resemble Soviet-era Delta Class boats, do not need to be as quiet as SSBNs in the US, UK, Indian, Russian and French navies. It is acknowledged that the Jin Class lack stealth, so this seems to be the solution to keeping them secure. They need never stray out of the threat-free bastion of the South China Sea while their JL-2 Submarine-Launched Ballistic Missiles (SLBM) will still be able to hit the cities of putative foes. Many defence analysts increasingly see that as the major driving force behind Beijing’s actions in the South China Sea. Not even an international ruling that warns the Chinese their attempted annexation of islands and reefs is a blatant violation of international law will deflect them. China’s immediate response to it was a spectacular firepower display by the PLAN in the contested seas, while announcing an equally ambitious joint exercise with Russian Navy units for this autumn. The ruling by the Permanent Court of Arbitration (PCA) at The Hague was itself prompted by a dispute between the Philippines and China over ‘the role of historic rights and the source of maritime entitlements in the South China Sea’. China made clear to the PCA that it would ‘neither accept nor participate in the arbitration unilaterally initiated by the Philippines’. It was therefore never likely to pay heed and amend its doctrine of might is right, allied with possession of the reefs and islands justifying its own claim to the entire South China Sea. Lu Kang accused America of hypocrisy. He said the USA is “selective when it comes to the application of international law”. For all the sound and fury emanating from the Chinese foreign ministry, the PLAN was still invited to send a task group to exercise with US Navy and other nations’ warships during Exercise Rim of the Pacific (RIMPAC) 2016. 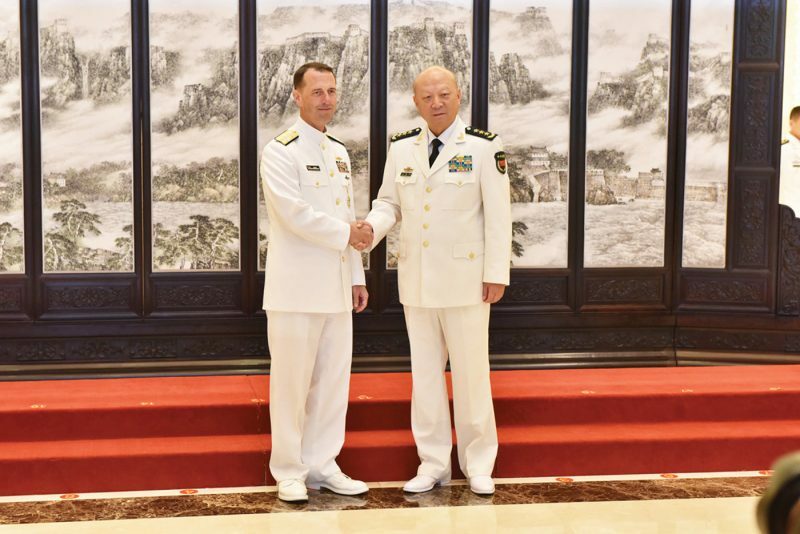 US Chief of Naval Operations (CNO) Admiral John Richardson meets with Admiral Wu Shengli, Commander of the People’s Liberation Army Navy (PLAN), at the naval headquarters in Beijing. Photo: US Navy. According to a USN source, the naval leaders had ‘frank and substantive conversations on the importance of operating safely, in accordance with international law; future opportunities for the two navies to engage; and the South China Sea.’ While the two admirals had previously engaged in discussion via video teleconferencing this was their first meeting in person and the first time the CNO had been to China. As the talks concluded, China’s state media was reporting that during the behind-closed-doors discussions Admiral Wu told Admiral Richardson his nation would never “give up halfway” on its construction programme in the South China Sea. The English language newspaper China Daily also reported that Admiral Wu had stated China will not give in to international pressure and it has made “sufficient preparations” to deal with any attempts at provocation or incursions into areas of ocean it considers to be its sovereign territory. A Chinese advanced diesel-electric submarine of the Song Class. Photo: RAN.